I checked a few nests today and there are still some ospreys around! I visited one nest that was empty but as I sat there I saw an osprey flying off in the distance, so I went searching for him. I could hear a juvenile food begging but could not spot him. I went back to the nest...still nothing there, so I started walking and listening and finally located the juvenile in a tree. I did not find an adult, but I believe there was one that the youngster was asking for food. I went to another nest on the other side of town and found a juvenile female on her nest, preening and snoozing in the lovely autumn sun. So here it is, Sept 29, and we still have some youngsters that are not ready to start their first migration. Interesting. I will keep you posted! It was a glorious morning here in Minnesota...high fifties, a crystal clear sky, light breeze. I began my day at the farmers market and then proceeded on to check some osprey nests. I visited several of the nests that had fledged rather late and still had juveniles on them four days ago. The first nest I visited produced no ospreys at all, where there had been two young females a few days ago. The next stop was a nest that had one juvenile present four days ago. No ospreys seen or heard there either...but there was a lot of human activity there which made me wonder if that was the cause for the empty nest. I decided to pop over to a nearby nest where I had seen one adult on the last visit...he was still there, perched on the edge of the nest with a fish. After about fifteen minutes he flew in circles above the nest, displaying the fish for any hungry youngsters to see. Sure enough, he scared up another osprey and they flew in circles together for a while before the adult returned to the nest. Oddly, the other osprey landed only briefly before disappearing completely. I was not able to identify the bird as a juvenile or adult. Then the adult male took off also. I moved my car for a different view of the area. I located the adult male in a tree with his fish, but could not locate the other osprey. I returned to the other empty nest...still no ospreys there. I later received two emails from osprey observers who said they did see ospreys back there in the afternoon. I visited another one of the very latest nests to fledge and found two youngsters in the area, both with a fish of their own, tho I could not locate any adults. So we do have a few ospreys lingering in the area, tho many nests are empty. Its amazing how mesmerizing it is to just watch an osprey eating a fish, when you know it is a sight you may not enjoy for many months. I soaked up the sun and the pleasure of watching my beloved ospreys on this lovely early fall day. I have gotten behind here...life gets busy for me this time of year. 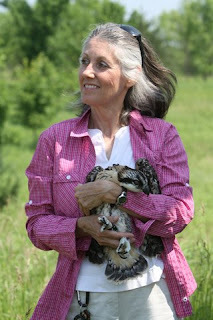 Last week I visited the young female who moved herself to another nest, where she was adopted . The other three chicks on that nest had become independent and the female has been gone for a while. The adopted juvenile was still sitting on the nest food begging, and the adopted Dad was on a nearby telephone pole. The youngster would fly loops around the male, while hollering for food vociferously. There was a strong north wind that day and when she flew back to the nest she was flying so fast, she zoomed right past the nest and had to struggle back against the wind. I can see why migration is so much easier with a strong wind ! She was still keeping her right eye closed a lot that day, as she has on previous visits. Today I checked her again and found no ospreys anywhere near the nest. So I guess she and the resident male are on their way. I will wonder about her for a long time. I also visited 13 other nests and found one nest with a single adult male, one nest with a single juvenile silently preening and at one of the latest nests to hatch and fledge chicks, there were still two chicks food begging loudly, tho I could not spot an adult. All the other nests were empty. One of my trusty volunteer nest monitors found a few chicks and adults present on her nests yesterday. So there are a few of our friends still in the area, but our osprey viewing days are numbered I am afraid. I will try to check on a few birds this weekend. Checking a few more nests today...one of the latest fledgers. I found both chicks still near the nest, both are females. One had a fish and was happily eating, the other was food begging. Lo and behold, here comes an adult with a fish, but it's the adult female, not the male. No sign of the male. Hmmmmm. I saw the male here a few weeks ago, but at this late date I would expect to see the male not the female feeding them. I know of two other nests that are being fed by just the female, with no sign of the male for some time...since mid summer? I think we may have lost a few males this year. But at least it was good to see those two chicks staying out of trouble! Still wondering if these chicks and adults will stick around longer than usual before beginning migration, given their late start in life. Keeping track of all this to see if climate changes will alter the ospreys behaviors. I checked on the juvenile who moved herself to another nest today. She was still sitting on her adopted nest alone. After 1.5 hours, her adopted father came with a fish for her...she grabbed it aggressively, and he went to a nearby power pole to sit and watch over her. Great male. She is keeping one eye closed a lot of the time, which worries me...but when she opens it, it looks fine. It's been like this for at least ten days. She flies well when she has the courage to leave the nest. I then visited another nest in the area and found another female chick sitting there alone too. Food begging whenever she saw another Osprey. This is how many female juveniles behave. When will they venture forth? We have also been watching over an adult female who had some sort of eye problem...at first it seemed crusty and swollen...only open a slit and she did not leave the nest for many days. We were very concerned. Eventually she began to open it more, and began flying more...short distances, and was depending on her mate for food (fairly normal). She did fight the chicks for food when it was delivered. I last saw her last Sunday...eating a fish, next to her mate, on a cell tower a ways from their nest. Still keeping her eye closed a lot, but opening it to fly and land. I suspect they are on their way now...but I will look for her again tomorrow or Monday. We may not know about the final outcome with her eye until next spring. She is a middle aged female who has been a very successful breeder, so we do not want to lose her. Hoping to see her again in April! So I keep checking on the ones who I have concerns about. Still learning and documenting behaviors. Another short post. I am sitting at one of the nests that belongs to the fellow who produced six chicks at two nests. When I arrived there were no ospreys here (or near his other nest). I waited. Finally the banded male showed up with a fresh, flopping bullhead. He perched and waited. No chicks showed up. He took a few bites of the head, and then he waited, looking all around. Still no juveniles. After about 15 minutes, he took off in the direction of the other nest. Less than two minutes later I heard the distinctive whining calls for food that a youngster makes, as he came flying in to the nest. But he had a fish! Not the same fish tho...different species and this one appears to be dry and stiff. Did he catch it himself? He is on the nest finishing it. He is the youngest of the chicks from this nest...seemed to almost be a runt at the beginning. He is doing well and has become a handsome male. Now he has finished his crusty fish tail and is moving sticks on the nest...finally flies off in the same direction that Dad went. Maybe he can hustle some of that bullhead! Yum. As I drove down the road I found one of his siblings perched in a tree, full crop, quiet. So Dad is still around, watching over the kids. For those of you who were worried...all is well, they will be fed or they will catch food when they really need it. Still fun to watch these behaviors. Ospreys are definitely on the move now...many transmittered birds have left their territories in the UK, Montana. I am still checking nests here and finding many birds still present, but many nests are empty now too. I just stopped at that favorite nest of mine...and found dear old dad perched high on a nearby cell tower, watching over things. One chick perched in a tree with a stick clutched in her talons! As I mentioned earlier , this is part of her practicing...she flew a round carrying that stick and landed without dropping it! Well done! Did not find the other chick or Mom. She may have started her migration. I am sure the other chick is around somewhere! Yesterday I visited the chick who moved herself to another nest. She is still there, alone. I saw none of the other three chicks or either adult. However there was another male perched nearby with a fish, unrelated to either her natal nest or adopted nest. Hmmmm. I wonder if part of her departure might be related to the fact that I have not seen her father since early summer. I think something happened to him and the adult female there had to care for these chicks alone. There may not have been enough food at her natal nest. It's a complicated situation, with many factors that may have led to her move. Interesting tho, and I continue to learn so much about the subtle behaviors, reactions, survival tactics that influence every bird. Still spending a lot of time in the field, gathering data, observing, learning. Well...I went out just to check a few nests quickly today...and was gone all day. That's what happens to me! I found a lot of food begging chicks...with no visible adults! They seemed to be food begging from each other. One pair of juveniles were launching into a chorus of food begging when two turkey vultures flew over! For Pete's sake! I also spent two hours at one of the nests that belongs to the male with two families. There were two chicks there, moving around from one perch to another, sometimes on the nest, hollering for food from each other. Their crops were empty and neither one pooped in that time. I saw no adults at all. Finally the female chick took off and the male chick remained on the nest, silently waiting. I also checked on one of the last nests to fledge chicks and found all of them present in the area, perched around, flying loops, going from perch to perch. So all have remained out of trouble and close to home. I did see one adult there, soaring above. Some nests were empty and few females were seen. I did see two mated pairs, still hanging out together a short ways from their nests...good to see them, knowing that their time together will be short now. I say silent farewells, hoping they all survive to return to each other, their territories, and to me! What is it about Ospreys? What is it about Ospreys that is so captivating? They have caused me to spend 20 years studying them, to devote my life savings to this effort, living below the poverty level in order to keep visiting over 90 nests in my eight county study area here in Minnesota. And I still can't fully explain my love for them. No other bird captivates me like this. It remains a mystery...but I see that I am not alone! It's so wonderful to connect with people all over the world who understand this love and who have been supportive of what I am doing. Thanks to all who share this passion. I appreciate those of you who contact me out of concern for some bird, some nest...I am happy to do welfare checks. I love running into some of my volunteer monitors in the field, and being greeted with such enthusiasm. I love the nest hosts who call me with interesting observations, concerns. Thanks to all who help me watch over these raptors...it takes a village! I was watching a male in a tree eating a fish, as the female on the nest was food begging vociferously. He ate the whole fish and then preened a bit, as she continued her cries for food. Finally he flew off and came back in less than two minutes with a fish for her, delivered it to her and quickly took over incubation duties. Males must feed themselves first, not out of selfishness (an anthropomorphic projection of human motivation) but so they can remain strong enough to be a good provider. On the other hand, I was watching one of the nests whose male is caring for two females on two nests. He was eating a fish as one of his females was soliciting food loudly...and half way thru his fish he delivered the remains to her. She left with it and he took over incubation duties, but within a few minutes, he jumped up and flew off. She was not done eating, but had to return to the nest, bringing the fish with her. She dropped the fish remains on the edge of the nest and resumed incubating. It's what she has to do. This must be getting difficult for both females, who do not get enough food, enough time away from incubating. It will only get worse when the chicks hatch and he could potentially have eight mouths to feed...if there are 3 chicks and a female on both nests...in addition to feeding himself. I am hoping for some very small broods and some females that are willing to hunt. I spent the day checking nests with one of my most dedicated volunteers. We have a great time and always find something new and interesting, exploring back roads. We read some bands, some escaped us. We found a pair who had been driven off their nest by human activity safely settled somewhere not too far away. I had to confirm a band I read earlier...after checking the band list and realizing it was a new male on the nest, and the male from last year appears to have been replaced by his brother! Seemed like too much of a coincidence, so I reread the band to be sure. Yup, that's what happened. A productive day in the cold, gray mist. Thanks again to ALL my nest monitors. I appreciate each and everyone of you who shares your observations throughout the season. I couldn't do this without you! Another interesting day in the field. This is the time of year that we start to discover nests that have failed for one reason or another, and that is what happened today. For several weeks I have been visiting a nest and finding an extra male harassing the incubating pair. The unbanded male interloper was there most of the time, trying to land on the nest, perching nearby, doing a sky dance, and both the male and female would leave the nest to chase him away. I was there a week ago and this scenario was playing out again. Today the residential banded male was nowhere to be found and the female was no longer incubating. She just perched nearby, preening. Then she was joined by the unbanded male. He behaved defensively, turning his back to her and shaking his wings occasionally. Other times they just preened near each other. No vocalizations, no chasing. I was there for nearly three hours and did not see any incubation or the banded male. Wish I knew what actually happened. Perhaps a new frustration nest will pop up in the area, or I will find the banded male elsewhere. Hmmmmmm. Sometimes I can figure out why a nest failed. If they incubate too long we know the eggs were infertile. Sometimes the behaviors of the adults give us clues. A sudden abandonment can be due to predation. Storms and hail can damage eggs. I am not sure what happened in this case. I do not believe a new male would easily run off the territorial male mid season. Did something happen to the banded male and the new male is just taking advantage of the opportunity to take over this territory? Hopefully further visits may offer some insights. I have documented two "divorces" so far this year. Pairs where both are alive and well, but moved to another nest with another mate. Usually the split occurs after a failed breeding season the year before, and that is the case with both these pairs. I was watching one of the new pairs today...a sweet new bond forming. The new pair were sitting on the same branch in a tree in the late afternoon sun. Both were calm and peaceful. The male kept walking a few steps closer, sitting for a while, then a few more steps in her direction until they we sitting side by side, almost touching. Then just preening and snoozing comfortably together. She is small for a female, and he is a handsome male, with a totally white breast. Nice. We also have a pair that is sharing their twelfth year together. That's is the longest known pair bond so far in this study. Another day in the field, and 178 miles! I visited 21 nests...not all I had hoped to get to, but still a productive day of data gathering. Out of the 21 nests, 13 were incubating. I read five additional bands. One osprey, nesting in a very difficult spot for band reading, was found perching in a low, easy spot and I got his band read quickly once I noticed him in the trees. My sincere thanks to him! Oddly, several nests where I had observed ospreys before were vacant today. There is one pair that is moving around, seen here and there, but just not ready to choose their nest and lay eggs. A few others are settling in, but have not popped out any eggs yet. I found one female who has moved to her third nest..After repeated nest failures, she keeps swapping nests and swapping mates. Hope this one is the right one. The pair who seemed to fighting a pair of eagles for their nest, are back on the nest. No eggs. Other ospreys seen there too, so I am searching for another nest in the area. I have to be a bit of a detective to figure everything out, and to find new nests. Please do let me know if you see ospreys dropping sticks anywhere! And if anyone out there has a huge telephoto lens and would like to help me get a difficult band read, let me know. I mean REALLY long...and still we will have to blow it up. But it might be easier than me sitting for hours and hours and waiting for this bird to sit still where I can see the legs. That moment when they come in for a landing, with both legs dangling, might just reveal what I need with a fast, long lens. I came home to a sweet phone message from one of the osprey nest hosts, telling me the birds had laid their first egg. Nice. Thanks to everyone who helps and supports me in this work, in so many different ways. Deep appreciation on this end. It's been hard for me to keep up here...lots of interesting things happening. Eagles are proving to be more of a problem than in the past. With the increase in the population of both species, it's not surprising that the conflicts are also on the rise. One nestpole host contacted me to report that the ospreys were gone and eagles were on the nest. But the ospreys have been seen again on the nest with eagles perched nearby. It remains to be seen who will end up on the nest. Eagles used to be considered to be sub canopy nesters , while ospreys are super canopy nesters...but apparently that is no longer necessarily true. The nesting choices of most ospreys may provide greater protection from predation. Many nests are incubating now, new nests are popping up. We also have one male who is shuttling back and forth between two nests and two females. It's happened before, and one female will end up getting the short end of the fish. I suspect one nest will fail. I am also observing a great deal of disturbance from other ospreys too! Too many ospreys fighting for territories and choice nesting spots. As the population increases it also provides greater opportunities for extra pair copulation. Mixing up the gene pool. I am plugging away at reading bands but some ospreys are just not cooperating! Nor is my old car...an expensive repair has slowed me down a bit.